Howard Charlie Howell, son of William Martin Howell and Eva Knight, husband of Mary Louise Moss. Mary Louise Moss, daughter of David Lee Moss and Ethel Burilla Abernathy, wife of Howard Charlie Howell. During the Depression, Howard Howell, along with his brothers, made moonshine to support his family. He gave that up when he began attending church. In his later years, he worked for the Georgia state highway department. He married Mary Moss in May 12, 1928. He fathered four children, two died as infants. His nine grandchildren called him "Pappy." After his wife's death, he married Annie Mae Elrod Goss, a widow who lived out the road. During World War II, Mary worked as a "Rosie the Riveter" at the Bell Plant in Marietta, Georgia, building airplanes for the military. Howard C. Howell, Of Route 2, Center Road, Cartersville, died Thursday, November 17, after an extended illness. 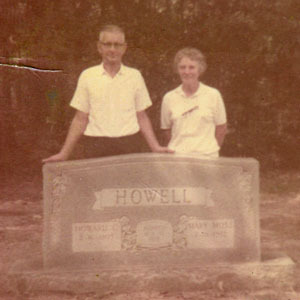 Mr. Howell was a native of Bartow County, was a member of the Center Baptist church, the Cartersville Masonic Lodge No. 63 and was a retired employee of the Department of Transportation. 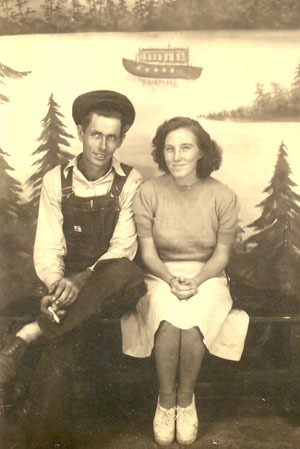 A son of the late Martin and Evie Howell, he is survived by his widow, the former Annie Mae Goss; two daughters, Mrs. Nicky Williams and Mrs. Al Williams, both of Woodstock; three step-sons, James Goss, Cartersville, Ronnie Goss, Marietta, and Lari Goss, Tucker; four brothers, Hubert, Hoy, Herman and Harold Howell, all of Cartersville; four sisters, Mrs. Armaretta Shinall, Mrs. Imogene Brooks, Mrs. N.D. Abernathy and Mrs. Gertrude Shinall, all of Cartersville; 14 grandchildren and a number of nieces and nephews. Funeral services were held at 2 p.m. Friday from the Center Baptist Church with the Rev. Lari Goss and the Rev. Charles Howell officiating. Interment was in the old Macedonia Cemetery. Nephews and grandsons served as pallbearers. Mrs. Mary M. Howell, of Route 2, Cartersville died early Wednesday morning following an extended illness. She is survived by her husband, Howell Howell; two daughters, Mrs. Al Williams, Woodstock; and Mrs. Nicky Williams, Woodstock; seven grandchildren; her step-father, A.L. Abernathy, Cartersville; two sisters, Mrs. Herman Howell, Cartersville; and Mrs. Reece Berry, Chattanooga; a number of nieces and nephews and several aunts and uncles. Funeral services were held at 3 PM Thursday from the Center Baptist Church with the Rev. Max Abernathy officiating. Interment will be in the old Macedonia cemetery. 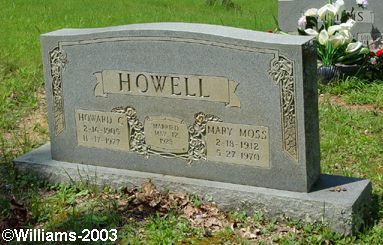 Mrs. Howell was a native of Bartow County and was the daughter of the late Lee and Ethel Abernathy Moss. She was a former employee of Bartow Textile Company.